Please click on the questions to link to the answers. 1. Are the DHP officers REAL police? 2. How do you know the officers are really patrolling, especially in the middle of the night? 3. How many arrests have Patrol officers made? Isn't that what's important? 4. Why should we join if we’re already protected by a security system…3 dogs…etc.? 5. Why should we pay extra for the DHP when we already pay for police protection via our property taxes? 6. Can members call the officers directly in an emergency? 7. Why does the Patrol use an identified vehicle? Wouldn’t patrolling in an unmarked car be more effective? 8. 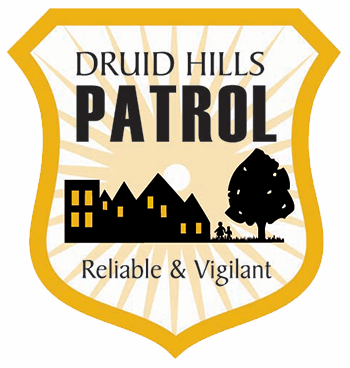 Why do I see the Druid Hills Patrol vehicle out during the day instead of patrolling at night? Don’t crimes like car break-ins occur mostly at night? 9. Why don’t I see the patrol vehicle? My street is in the catchment area. 10. Why doesn’t the Patrol operate 24 hours per day? 11. Why are the police departments understaffed?